VANCOUVER, Oct. 23, 2013 /CNW/ – TELUS has entered into an agreement with Public Mobile to obtain 100 per cent ownership of the company. Pending approval from the Competition Bureau following today’s approval by Industry Canada, the transaction will ensure continuity of service and enhanced functionality for Public Mobile’s 280,000 wireless customers. Terms of the transaction have not been disclosed. Proceeds will be used to satisfy Public Mobile’s debt and equity investors. Public Mobile employees will have the opportunity to review and secure roles with TELUS. Public Mobile has operations in Ontario and Quebec. Public Mobile customers will now have their product offering evolve to also include the availability of higher-end handsets offered by TELUS. TELUS provides 4G wireless coverage to 99 per cent of Canadians from coast-to-coast-to-coast. The Industry Minister hinted at a few points that the Government would highlight in its Speech from the Throne today, specifically that Canadians have been ‘hit in the face pretty hard’ with high roaming fees. To give Canadians wireless hope and more choice, the Government will, as expected, “take steps to reduce roaming costs on networks within Canada.” The specifics were not mentioned, but the CRTC recently declared that they were “made aware of concerns with respect to the rates, terms, and conditions associated with wireless roaming” and mandated all carriers submit roaming revenues dating back to to 2007. To-date, many carriers have already cut the cost of their international roaming rates. Spurned by Canada’s federal government that last week branded his interest in the country’s telecoms sector a national security concern, Egyptian billionaire Naguib Sawiris has pledged not to invest “even a single penny” in the country. “I am finished with Canada, I tell you,” the telecoms tycoon toldAhram Online after the fibre optic company he thought he was set to acquire for C$520 million ($US504 million) said it was ‘extremely surprised and disappointed’ Canada blocked the bid. “The world is big and my money can go anywhere,” said Sawiris, the eldest son of the Coptic Christian family that controls the sprawling Orascom corporate empire. “I regret that we wanted to invest in Canada,” said the tycoon in an interview in Cairo, weary and defiant in the wake of the takeover deal that Canada quashed. In the wake of Mohamed Morsi’s downfall, “the only good news” about the ill-fated review according to Sawiris is that he can invest the money – the equivalent of LE 3.5 billion – that was allocated to Canada in Egypt whose political and economic situation he is now “very optimistic” about. “I think it will move forward,” said the founder of the liberal Free Egyptians Party and opponent of the Muslim Brotherhood. After the Brotherhood’s ascent to public office and until recently, to many his course appeared set on a path of divestment from his Egypt-based enterprises. Earlier this year, Sawiris sold nearly all his shares in Russian telecom giant VimpelCom (VIP), which acquired the Sawiris’ Orascom Telecom Holding in a cash and stock transaction two years ago, and saw his net worth fall US$0.6 billion in March against Forbes ratings a year before. “I have a right to be upset. I won’t even go to Canada,” he said. Accelero Capital Holdings S.a.r.l. Group, a Paris- and Cairo-based investment firm co-founded and controlled by Sawiris, in May announced its plan to acquire Allstream, the wireless enterprises services division of regional Canadian telecom company Manitoba Telecom Services Inc. (MBT). Last Monday, Canada’s Conservative Harper government scampered that plan: the transaction didn’t meet the ‘net benefit’ test of the Investment Canada Act. The country’s foreign investment law weighs a potential investment’s benefit on Canadian employment, exports, and productivity, but also allows for a veto based on national security concerns. “They don’t have anything specific to say,” according to Sawiris, referring to Canada’s citing of unspecified national security concerns. “They were very worried we could sue them. We spent millions of dollars to prepare [for the transaction],” said the would-be buyer who also sits on the international advisory committee to the New York Stock Exchange’s Board of Directors. Canada’s government shouldn’t have allowed the sale in the first place if they had restrictions, said Sawiris, who added he was “never told” about any objection to the bidding in the 136 days since the transaction was announced: “We had been totally pre-cleared.” Manitoba said in its statement that Accelero had proposed ‘far-reaching, comprehensive and binding undertakings’ to the Canadian government, including a commitment to invest $300 million over three years to pursue Allstream’s capital plans. Sawiris returned to Egypt in May after a period of self-imposed exile and as the Egyptian government settled for US$1 billion a controversial tax dispute with Orascom Construction Industries SAE (OCIC), Egypt’s biggest listed company by market capitalisation run by Naguib’s brother Nassef Sawiris. Naguib Sawiris heads investment firm Orascom Telecom, Media and Technology SAE (OTMT). Five years ago, Sawiris had success in a bid for a Canadian mobile licence and backed Wind Mobile there with a $700 million loan. That loan helped finance Wind’s purchase of advanced wireless spectrum (AWS). After the success of the 2008 Wind licence auction, Sawiris found no reason to expect otherwise this time around. “I am the same person,” he said, noting that his money was held in escrow at Winnipeg-based Manitoba. Manitoba said in a statement the Canadian government’s previous ‘active support’ of Accelero played a ‘significant role’ in its decision to sell to Accelero. It said Accelero had led an investment of about $1 billion in Canada’s telecommunications sector, beginning with the 2008 AWS auction. After the veto, the only issue Sawiris can think of is that the company he is chairman of – Orascom Telecom, Media and Technology – has a 75 percent stake in Koryolink, North Korea’s sole 3G cellular operator that launched its service in 2008. When the transaction got held up in the Canadian approval process, Accelero and Manitoba made a series of concessions to appease Canada’s government, according to the Globe & Mail newspaper, citing people familiar with the discussions. According to those people, the Canadian newspaper reported that Allstream, which carries voice and data for governments and corporations, said it would agree to stop carrying sensitive government data and not use telecom equipment from China’s Huawei Technologies Co. Ltd. on its network. While Huawei declined the allegation at the time, the U.S. House Intelligence committee had said that China’s biggest phone-equipment maker allow Chinese intelligence to interfere with U.S. telecommunications networks for spying. When examining the deal, Canadian federal officials raised questions about Sawiris’ investments in North Korea, specifically in connection with the Koryolink cellular network relationship, the Globe & Mail reported, citing the same unnamed sources. “It’s totally unacceptable to have foreign investors waste their time and money, hold their capital captive, and then come up with a comment like that,” said Sawiris, referring to the Canadian government decision based on national security concerns. Canada’s investments in Egypt “should be treated in the same way,” the tycoon said. The Allstream-Manitoba veto follows a relaxation by Canada’s parliament last June of foreign ownership restrictions in Canada’s Telecommunications Act, permitting foreign control of carriers that have a less than ten percent market share by revenue. George Addy, a senior partner heading Toronto-based law firm Davies Ward Phillips & Vineberg LLP’s Competition and Foreign Investment Review group, said in a statement the decision appears to be the first time since the national security review provisions added to the Investment Canada Act in March 2009 that Canada’s government has publicly announced a decision to prohibit a proposed investment on national security grounds following a completed review. The ill-fated Accelero MTS Allstream review follows two other high-profile Canadian telecoms sector veto decisions. One of those foreign takeover rejections was based on national security concerns: the 2008 blocking of a proposed acquisition by Alliant Techsystems Inc. (ATK) of Canadian aerospace company MacDonald Dettwiler & Associates Ltd. (MDA). Still, even if there had been extensive trade links between Canada and Egypt, the impact would have been minimal, because this is not a state-to-state issue, Hassan said. Developed countries should “practice what they preach to the rest of the world,” said Metwally, who made a return to investment matters in Egypt’s post-revolutionary economic environment after more than 30 years working abroad, in Dubai, Abu Dhabi, Bahrain, the United Arab Emirates, the United States, Britain, and elsewhere. “Someone like Sawiris has the whole world to look at for the right investment opportunity,” said Metwally, who served as senior advisor to Egypt’s then finance minister Mohamed Medhat Hassanein between May 2003 and April 2004. BlackBerry has struggled this year as sales of its latest smartphones failed to catch fire. The company launched a strategic review to explore its options including the possible sale or break up of its operations. Fairfax Financial (TSX:FFH), BlackBerry’s largest shareholder, has made a conditional takeover bid worth $9 per share, which values the company at $4.7 billion. Together Lazaridis and Fregin own roughly an eight per cent stake in BlackBerry. OTTAWA – There is no working market for domestic wholesale roaming in Canada, which has led to sky-high rates that injure competition, says Halifax-based cable and wireless company Eastlink. Conversely, Bell Mobility argues new entrants have the choice of three providers, all of which are girding for roaming business. Bell Mobility says it’s important to remember that there are two types of wholesale domestic roaming agreements: reciprocal and one-way. Reciprocal deals see customers from each carrier roaming onto the other, while one-way agreements involve new entrant users roaming onto an incumbent’s network. 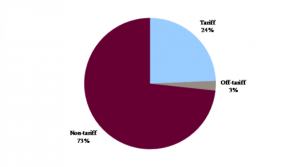 Bell acknowledges that the rates for one-way deals are higher than those of reciprocal agreements. The company argues in its comments that if there were a wholesale roaming rate problem, it would be reasonable to assume that it would be forced into arbitration discussions with a rival carrier (arbitration is required if two carriers can’t come to a roaming agreement). But this hasn’t been the case. Besides, Bell states that there is no reason for the Commission to stick its nose in wireless rates. It points to the recently released Wireless Competition in Canada: An Assessment, a report prepared by the University of Calgary’s School of Public Policy (For more on the report, click here) and Telecom Decision 2012-556 which provides evidence that intervention in the regulation of wireless service rates isn’t warranted. Telus echoes Bell’s sentiments about the state of competition in Canada’s wireless markets, referring to the same decision in its comments. The company goes a step further arguing that if the commission were to decide to regulate retail roaming rates, it would first have to revisit its previous wireless forbearance decisions. Eastlink’s submission, on the other hand, says that sustainable wireless competition is in jeopardy if the Regulator doesn’t do something to address domestic wholesale roaming. The company notes the current wholesale roaming regime has already had a negative impact on its ability to offer services. “For example, it was not possible to launch service in Nova Scotia until half the province was built, to minimize our reliance on roaming. This completely defeats the purpose of mandatory roaming as set out in the conditions of licence, and serves only to delay rural Canadians’ access to advanced wireless services and competition,” states Eastlink. Bell says the real problem around roaming revolves around bill shock from international roaming. The company argues that the forthcoming enforcement of the wireless code of conduct beginning on December 2 will solve many of those issues. This includes caps on data charges and the mandated unlocking of devices, which gives consumers the ability to use SIM cards in other nations. TORONTO – Approximately 1.1 million Internet households in Canada have no paid TV subscription and cord shaving by those who are subscribers is on the increase says new research from Toronto’s Solutions Research Group. • About half of existing “no paid TV” households with Internet report having cancelled their TV service within the past five years and 10% in the last year. And one-in-three never had paid TV service before but had Internet. The combined number of annual cord-never and cord-cutting households is estimated at over 90,000 per year (about the size of a market such as Regina). • Average age of a decision maker in a ‘no paid TV’ household was 35, seven years younger than the overall average. • No paid TV subscription in the home does not mean there is no TV viewing – in fact just the opposite: 65% watched a TV show online and nearly half – 45% – streamed Netflix in the past month in these households. No Paid TV households with Internet were 70% more likely to stream Netflix than average. • 13% of paid TV subscribers in Canada said they seriously thought about dropping their subscriptions in the last six months but did not act on it. This is about the same level of consideration as last year, but there is an increase in the number of households downgrading their level of service, whether by dropping a channel or a tier. Sixteen percent of households have downgraded in this last wave of research vs. 12% two years ago. • Authenticated TV Everywhere is not catching on: Only 7% of paid TV customers are using an authenticated ‘TV-Everywhere’ type of online portal or service provided by their TV provider (such as Rogers Anyplace TV or TMN Go). Significantly, 36% say they have heard of such services but never used and almost half – 48% – have no knowledge of their TV provider offering such services. A segment of younger Canadian adults are choosing to only take Internet as they set up their households or drop TV as they move residences and at the same time, a significant proportion of households populated by older adults are concerned about the increasing cost of TV subscriptions. These two factors will continue to exert pressure on TV providers in the short to medium term, says the report. The results come from SRG’s Digital Life Canada study which interviews 1,000 online Canadian consumers aged 12 and older every quarter. The latest research was conducted in August 2013. Already dim hopes for an infusion of foreign investment in Canada’s telecommunications sector faded further Monday with news that Ottawa has rejected Manitoba Telecom Services Inc.’s plan to sell its Allstream division to Accelero Capital Holdings. The deal announced in May valued the Manitoba-based company’s enterprise wireline business at $520-million and the man behind the foreign buyer, Egyptian telecom magnate Naguib Sawiris, was already well known in Canada. The federal government liberalized the rules on foreign investment in small telecom providers last year, but Industry Minister James Moore said in a brief statement Monday that after a review under the national security provisions of the Investment Canada Act, the transaction would not proceed. “MTS Allstream operates a national fibre optic network that provides critical telecommunications services to businesses and governments, including the Government of Canada,” the statement said. Pierre Blouin, chief executive of MTS, said in an interview he was profoundly disappointed with the decision, which came as a surprise after five months of review. He added that Ottawa did not provide a specific explanation for its concerns and rejected an offer from MTS and Accelero to correct any issues or change the structure of the transaction in some way. He added that Ottawa was already familiar with Mr. Sawiris, who is one of the co-founders of Accelero, an investment firm focused on telecommunications. “And in particular when you look at Accelero, which basically had the same principal that had been approved by the federal government a few years ago [as an investor in] Wind Mobile, which also was another factor when we considered Accelero for this transaction,” Mr. Blouin said. In his former role as head of Orascom Telecom Holdings SAE, Mr. Sawiris was one of the original backers of wireless startup Wind Mobile, which waged a lengthy battle with Canada’s telecom regulator over its ownership structure before launching its business. Ottawa overruled the Canadian Radio-television and Telecommunications Commission and later changed the foreign investment rules to permit non-Canadians to acquire small telecom providers with up to 10% share of the overall communications market. In a statement Monday evening Mr. Sawiris too expressed disappointment in the decision, noting that Accelero’s founders previously led the investment of about $1-billion in Canada’s telecom sector. “Throughout this process, we were comforted by Industry Canada that our filings were in order, our submissions complete and constructive, and our proposed binding undertakings serious and substantive so that the transaction would meet the ‘net benefit’ test,” he said. Mr. Sawiris has often used scathing words for Canada’s telecom regulations, saying the government has some “very ridiculous old laws” when it comes to foreign investment and that he regrets his foray into this country’s wireless market. But in May when the MTS deal was announced, he said his firm had a long-term commitment to the Canadian market. MTS said in a statement both it and Accelero are reviewing their options with their legal and financial advisors. Accelero put down a $55-million deposit when the deal was announced in May. MTS operates a full-service telecommunications business for residential and small-business customers in its home province and had been seeking a buyer for its Allstream unit since September 2012. As a result of the failed transaction, the enterprise division will once more be reported as part of the company’s consolidated results, MTS said Monday. The company provided an update on its financial outlook for 2013 Monday and while it expects no changes to its revenue forecast of $1.63-billion to $1.73-billion, it now expects EBITDA (earnings before interest, taxes, depreciation and amortization) to be between $540-million and $570-million, down from an earlier projection of $590-million to $630-million. It also now expects earnings per share for the year to come in at between $1.15 to $1.45, down from a projected $1.75 to $2.15 per share. Mr. Blouin said Allstream had 10 consecutive quarters of EBITDA growth before the strategic review and the company would focus an quickly bringing the unit back to that level of performance. The company has outstanding pension liabilities that have been a point of concern for some time. In May, it said it planned to use $130-million of the proceeds from the Allstream sale to make an additional contribution to the MTS pension plan and repay $70-million in short-term indebtedness it incurred in February to address the pension obligations. It said Monday its pension solvency funding requirement for 2013 will be met using letters of credit. MTS will report its third-quarter results on Nov. 7. 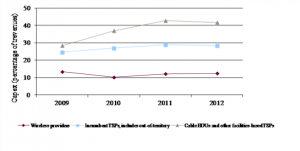 The CRTC’s annual “Communications Monitoring Report” has been released and shows a progression of wireless adoption in Canada. According to the findings, based on 2012 stats, shows that the wireless subscribers in Canada increased by 1.8% to 27.9 million (2011 had 27.4 million wireless subs). 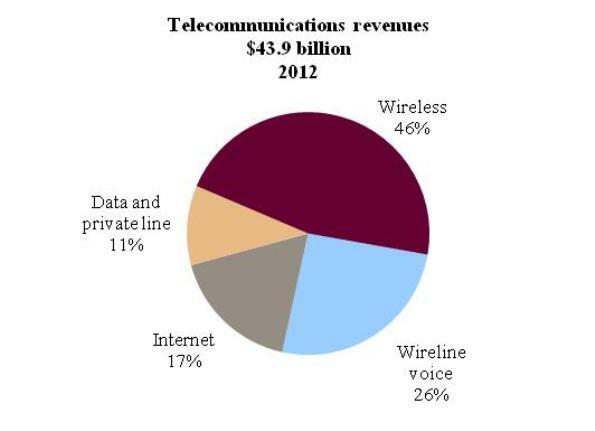 Wireless revenues now account for 46% of all telecommunications revenues and increased an impressive 6.5% to $20.4 billion in 2012. Rogers, Bell and TELUS continue to dominate the Canadian market share and own 90% of all revenues in the sector, but those companies like WIND, Mobilicity, Videotron and Public increased their market share in the past year by 1% to capture 5% market share in 2012. An interesting stat was roaming, specifically that carriers earned $1.6 billion in roaming revenues, including $799 million from voice usage and $784.6 million from data usage. Smartphone now make up the majority of devices that Canadians own, occupying 51% of subscribers, up from 38% in 2012. 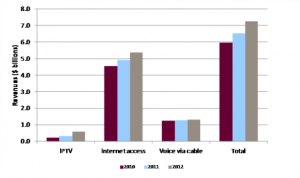 The average Canadian wireless subscriber pays $60.71 per month, up 4.7% ($57.98) in 2011. The report indicated that wireless networks are available to 99% of the Canadian population and that LTE (long-term evolution) can now be accessed by 72% of Canadians (up from 45% last year). Average retail revenues per subscriber per month are obtained by dividing total retail revenues by the total number of retail subscribers, then dividing this number by 12. Globalive, Public Mobile and Data & Audio expenditures were excluded. 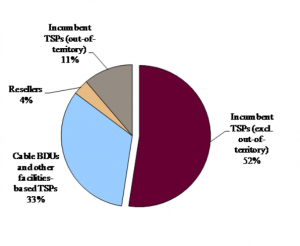 Estimates were made to capture revenues of the smaller TSPs that were not required to complete detailed survey forms. 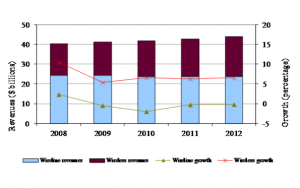 Local and Access terminal equipment and other non-telecommunications revenues were excluded. Markets includes local and access, long distance, Internet, data and private line, and wireless markets. Affiliates are included with their parent company. Top 5 are Bell, MTS, Rogers, Shaw and TCC. 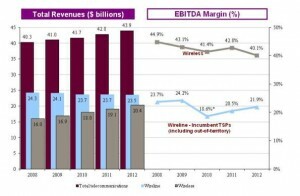 2010 Wireline – Incumbent TSPs (including out-of-territory) EBITDA figure has been restated due to company adjustments. 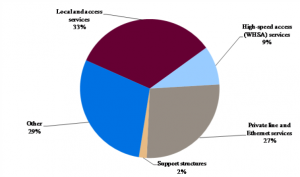 Globalive, Public Mobile and Data & Audio expenditures were excluded due to insufficient data. 1. Incumbent TSPs (including out-of-territory) and cable BDUs and other facilities-based TSPs exclude their respective wireless services. The number of Canadian subscribers to Netflix Inc.’s online streaming service has almost doubled year over year, reaching 21 per cent of Canadian adults this spring, according to polling data by Media Technology Monitor. MTM, a joint research project between CBC/Radio Canada and BBM Analytics, said that 21 per cent of Canadian adults say they subscribe to Netflix. Twenty one per cent answered yes, up from 13 per cent who said yes to the same question in an MTM poll conducted in the spring of 2012, which used the same sample size, said Jenny Meadows, a research officer with CBC and MTM. The online streaming service’s subscriber numbers in Canada may have ramped up in the first half of 2013 in part due to the release of Netflix’s original TV series House of Cards and a new season of Arrested Development. According to the most recent Canadian census, in 2011 there were 13,320,615 households in the country, and 21 per cent of that number would represent 2.8 million with access to Netflix. It’s unclear how many people polled interpreted the question to mean they have paid access to Netflix as opposed to having their own subscription. If the subscriber number percentage is extrapolated to individual Canadian adults, it would mean 5.77 million Canadian subscribers. Statistics Canada says there were about 27.5 million Canadians in 2012 who were aged 18 or older. The 21 per cent subscriber level is significantly higher than the company’s last stated number for Canada, when in July 2012 Netflix said it had “grown to over 10% of Canadian households” which would represent more than 1.3 million homes. A year earlier, in August 2011, the company reported that it had exceeded a million individual Canadian subscribers. MTM said in a July report that the percentage of anglophone Canadians subscribing to Netflix reached 25 per cent in the spring of 2013, rising from 13 per cent a year earlier. Meadows said that, based on those numbers, it would be accurate to say the service’s anglophone subscribers doubled during that time. Netflix, based in Los Gatos, Calif., does not publicly report its subscriber numbers in Canada, where it charges $8 per month for unlimited viewing. The online service is also available in the United States, Mexico, South and Central America, the Caribbean, United Kingdom, Ireland, Sweden, Denmark, Norway, Finland, and the Netherlands. Since then, the structures, the business models, the products and the technology of the industry have been dramatically transformed — to say nothing of the needs, the tastes, the expectations and the behaviour of consumers” Menzies said. For its second quarter of 2013, reported on July 22, Netflix said it had 30 million U.S. subscribers and eight million internationally.“ We’ll continue to expand in 2014 based upon the progression of our existing markets and on confidence in the expansion opportunities” the company said in a letter to shareholders at the time. Betsy Weber, a spokeswoman for Netflix, said by phone the company does not confirm its international subscriber numbers. Rogers Communications and U.S. wireless carrier Sprint announced today they will soon be offering Canadians high-speed wireless internet access in new vehicles. The cost of the project, pricing for the services and dates for the rollout weren’t included in a joint statement issued by the companies, which operate two of North America’s largest telecommunications networks. A Rogers spokesperson confirmed to CBC News that the new service will be available within the next year. The press release said the service will be available from auto manufacturers that deploy Sprint’s Velocity system in Canada and it will leverage Rogers’ wireless networks to connected vehicles on the road. New vehicles will be manufactured with a machine-to-machine (M2M) SIM card for built-in wireless network connectivity. “I think people are trying to figure out from an automotive context, or an in-car context, how you make these things relevant to what the person is doing in the car at that time,” said Rogers vice-president Mansell Nelson. Vehicles with Sprint Velocity — which has already been deployed in the U.S. — will have access to news, sports scores, weather alerts, driving directions and vehicle diagnostics via an in-dash touch screen. Sprint Velocity also provides in-car connectivity for mobile devices such as smartphones and tablets. “I think you’re going to see a lot of integration with the car into the broader Rogers product offering,” he said. 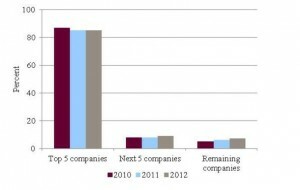 The connected car market is expected to be a booming business, with research suggesting nearly 100 million connected cars will be on the road by 2016. While hand-held devices are creating an ever-growing list of distractions for drivers, Sprint Velocity comes equipped with in-car safety features that both companies hope will alleviate the issue. “I think we’re concerned about it, as we are with driver safety in general, and trying to work with the original equipment manufacturer on what measures they’re taking to attempt to control this,” Mansell said. Sprint Velocity’s integration into the car will mean certain features, such as watching a movie, will be disabled while a driver is operating the vehicle, Mansell said. “The challenge with the smartphone today is it’s not integrated with the car and you do whatever you want,” he said. Canadian Automobile Association spokesperson Ian Jack said technological improvements in the vehicle were good as long as they don’t take the driver’s attention off the road. “There are some positive safety implications for this but on the other hand most of the research out there suggests distracted driving is becoming one of the leading causes of crashes,” he said. Research at the University of Utah funded by CAA and its U.S. partner, the American Automobile Association, has suggested devices that engage a driver in a “two-way conversation,” meaning talking on a cellphone or typing on a device, tend to be the most dangerous. “Even voice-activated texting, where you speak and it converts it into a text message for you, is an area that we have concerns about,” Jack said. “It’s not the fact that it’s technology, or that it comes in bits and bytes, it’s what it does to you as the driver,” he said.